Portable Kanban is a Personal Task Manager created by Dmitry Ivanov. 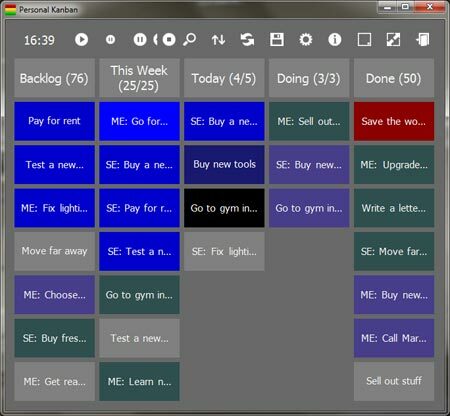 This Portable Free Personal Electronic Kanban Software might be used to help schedule and track your daily events or tasks and to monitor assignment productivity. Features include the ability to setup topics and columns however you like, assign tasks to certain people, keep track of time via the work timer, set breaks via pause, and much more. Portable Kanban uses an XML file to store it’s data. This Portable Personal Electronic Kanban Software is focused on applying the core principles and techniques of Lean manufacturing to your personal work.